Waist Not, Want Not ← You Want Me To Wear What? I love it when bad puns make for such succinct titles. Hey, you know what these are? 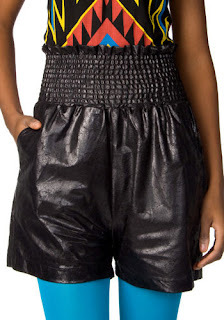 $75 polyester high waist shorts. I’m guessing the inseam is about 3 inches long; that leaves a whole 15.75 inches of high waist. This would leave the high waist resting somewhere along my bra line, as though I’m starring as Urkelle in a CW “reimagining” of Family Matters. Seriously – you know that if it were on the CW, even Urkelle’s wardrobe would be ridiculously expensive and vaguely on-trend. Also, someone would probably end up dead by the first episode, there would be a mysterious new boy in school, and everyone would look like they’re 27 – both kids and parents. Don’t lie. You know you’d watch that show. Exactly!!! I got a small pack (it’s the largest poibssle carry-on size) to force myself to pack ultralight, so now I do.I want to buy two more small size compression packs one for underwear now one for laundry! Thanks for that idea!